The leading United States industry association yesterday released its annual International Intellectual Property Index, ranking countries on their progress in protecting US intellectual property rights. The ranks show the US advancing in the area of patent protection, while retaining the top overall score; India strengthening IP and charting a course for other developing countries; and EU countries dominating the higher scoring bracket with Singapore first on patent protection. 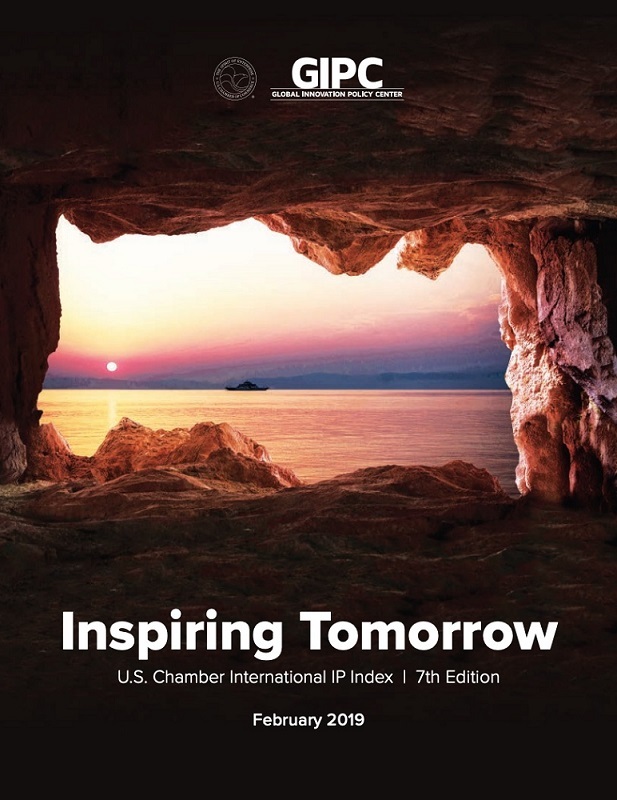 The US Chamber of Commerce Global Innovation Policy Center (GIPC) released its 7th International IP Index yesterday entitled, “Inspiring Tomorrow [pdf],” which “creates a roadmap for countries that aspire to foster economic growth and global competitiveness through stronger IP,” a Chamber press release said. The research for the index was conducted by Pugatch Consilium, and the report was authored by Meir Pugatch, founder, and David Torstensson, partner of Pugatch Consilium. Over the last year, IP has taken “center stage,” highlighted by the “ongoing trade dispute between China and the U.S. [that] brought much-needed attention to long-standing challenges that are holding back global investment in IP-intensive industries,” it said. The overall ranking sees the US, UK, several European countries, Japan and Singapore at the top. Particular progress to note is that the US rose in rank from 12th to 2nd in the area of patent protection, Mexico and Argentina advanced showing competitiveness in their region, while India and Brazil also advanced showing leadership for the BRICS (Brazil, Russia, India, China, South Africa) and other developing countries. 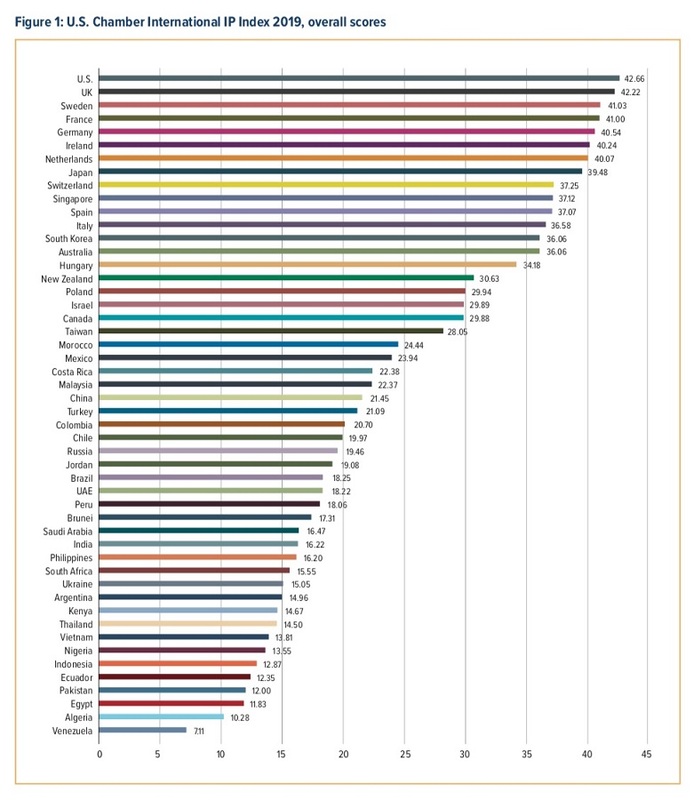 The index benchmarks the IP framework in 50 economies, representing 90 percent of global GDP. It evaluates IP infrastructure based on 45 indicators in 8 categories of IP protection: patents, copyrights, trademarks, trade secrets, commercialization of IP assets, enforcement, systemic efficiency, and membership and ratification of international treaties. “Intellectual Property at its core is a means to an end, and the end that we are seeking is innovation and creativity. Intellectual property laws, when they are strong, reliable and predictably enforced, drive [and] really enable investment in innovative and creative sectors,” Patrick Kilbride, senior vice president of the Chamber GIPC, said in a 7 February press briefing on the release of the index. This increased predictability of patents occurred under the leadership of Andrei Iancu, under secretary of Commerce for intellectual property and director of the USPTO, it said. “As the global intellectual property space becomes increasingly competitive, we must continue to fuel American innovation through a reliable, predictable, and high-quality patent system,” Iancu said in a USPTO press release. “I am proud of the USPTO’s work to secure the rights of inventors and brand owners to fulfill our constitutional mandate,” he said. In response to the release of the index and to the progress made by the US, Brian Pomper, executive director of the Innovation Alliance, a coalition of research and development-based companies, issued a statement. “We must continue the progress that has been made and work to ensure our patent system continues to serve as an engine for U.S. innovation and job creation,” he said. The index shows progress in BRICS and developing countries. While it notes that there is “room for improvement,” it points toward a trend of increasing global IP protection. “We want to see countries not just have access to US, Japanese, [and] European technology,” Kilbride said in the press briefing. Mexico’s score also advanced, in part due to its role in the US-Mexico-Canada Agreement (USMCA), which “includes provisions to help harmonize and strengthen IP protection across North America,” the index explained. The provisions of the agreement include “a 10-year term of regulatory data protection for biologics, more effective trade secrets protection, and stronger enforcement mechanisms against counterfeit goods, including those in-transit,” the release said. In Russia, “the government issued a compulsory license on an innovative biopharmaceutical product as a mechanism to address economic concerns around the cost of medicines,” it continued. “Unfortunately, the net effect of these policies is to undermine the economic conditions that facilitate innovation, R&D, and investment,” the index asserted. “Using compulsory licensing, in particular, as an industrial and health policy tool is not only outside international norms but ultimately self-defeating: over time it will hollow out the IP environment and reduce the opportunities for future innovation—biopharmaceutical or otherwise—in a given economy,” it said. "US Industry IP Index Released: US Advances, India Shows Leadership, EU, Singapore Near Top" by Intellectual Property Watch is licensed under a Creative Commons Attribution-NonCommercial-ShareAlike 4.0 International License. Minor Correction to typo error. Industry 4.0 has shown that IP is the new gold mine in the innovation economy of the 21st century collaborative partnership. However, IP system and IP laws and IP Regulation have been empirically shown to have a stifling effect on open and true innovative economy due to certain economic and political barriers and standings. To move forward, there is a need for IP Equilibrium within developed and Developing Industry 4.0 and beyond. Latin America’s interest must not be neglected at the expense of public health and emergency. Chile, Colombia, and Peru are looking at compulsory licenses provisions to address rising Hepatitis C concerns at home due to unfair pricing. Compulsory licenses in many ways, does NOT undermine legal certainty and does NOT jeopardize the availability of future innovative medicines in any region– even in Malaysia, Indonesia and Thailand for that matter. Compulsory licenses may be deemed as a factor within the IP Equilibrium Equation for a better and healthy world. This is something the US Chamber of Commerce Global Innovation Policy Center (GIPC) did not properly addressed in its index and measurement components. Compulsory licensing is a provision part of the whole WIPO-TRIPS agreement agenda to include developing blocs into the folds of IP Equilibrium forum. Compulsory licensing can be deemed to be a micro tool in achieving industrial and health policy tool within recognized international norms -and drives inclusive collaboration for Industry 5.0 sustainability leading to Society 5.0 and opportunities for future innovation. Compulsory licensing is a neutral variable within the IP Equilibrium Framework dichotomy. This is part 1 of the writer’s review.